Summary: The effects of artificial lighting are no longer limited to coastal properties. This proposal will initiate a Sea Turtle Education and Dark Sky Awareness campaign. Educational materials including: temporary tattoos, static cling decals, grocery totes, brochures and bumper stickers will be developed and distributed throughout Palm Beach County. Educational material will emphasize the effects of artificial lighting and the impacts of beach furniture on sea turtle populations. Funding is also requested for 15 advertisements on Palm Tran buses. 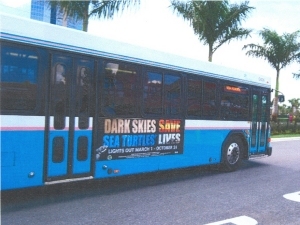 This form of public transportation will be used to display the “Dark Skies Save Sea Turtles' Lives” campaign along the coastal regions of Palm Beach County and will be displayed for a minimum of four weeks. Education of key user groups and property owners can help to reduce the impacts of sky glow and furniture interactions by promoting a better understanding of the extent that Palm Beach County beaches are utilized by sea turtles and by providing management recommendations to the public. Results: A majority of the temporary tattoos, static cling decals and reusable grocery totes have been distributed throughout Palm Beach County. The remainder of the material will be handed out during the 2010 nesting season. Newsletters and local newspapers published articles on the educational material funded by the Sea Turtle Grants Program and on efforts to protect sea turtles in Palm Beach County. Several educational presentations were given during the grant period. Sea turtle conservation and effects of lighting were discussed. Educational material was distributed to those in attendance. Public response to the new material was very positive. Palm Beach County's participation in Gumbo Limbo Sea Turtle Days.